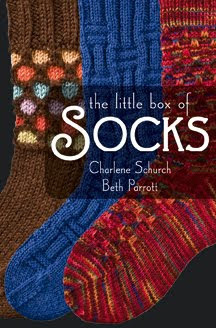 This week's review brings us to The Little Box of Socks by Charlene Schurch and Beth Parrot. This book really isn't a book at all - it's a box! Actually, it is quite literally a little box of socks. This box contains 20 pattern inserts and one insert on special techniques. When I opened this one, I quite literally squeed and said 'How cool!' before pulling out all the pattern inserts. Each sock pattern has it's own glossy folded card and has all the instructions you would need to knit the sock (cuff, heel flap, gussets, toe, etc.). And, these cards seem pretty sturdy. They would definitely hold up much better than all the folded up patterns that I end up throwing in the bottom of my knitting bag! There were lots of socks that I think I would enjoy knitting in this book. My faves include Lace Rib Socks, Slip Stitch Cable Socks, Faceted Rib Socks (which seems to be the popular one on Ravelry) and the Small Wings Socks. The Little Box of Socks is available from Martingale and Company. You can find a wee bit of errata on their website here. And, you can get your copy of The Little Box of Socks on Amazon for less than $15! So, read any good knitting books lately?